I’ve got the best deals anywhere! Camzeee here with an analysis of how to best use gold, time, and money in Hearthstone. I won’t do your financial planning but if it’s hearthstone spending we’re talking, I’ve got some advice for you! Firstly, if you haven’t done so already, get your beginner quests out of the way for an initial burst of gold. Most of you reading this have at least started playing hearthstone and level-upped all heroes to 10. This article is for you guys out there looking to grow your collection. Here is a little bit about me before we jump in. Since starting almost a year ago, I have worked hard to have an almost-complete collection. Initially, I went in with the goal of being entirely “Free2Play”. I found Ranked Play to be far too difficult as a beginner without acquiring more cards. As a result, I turned to Arena for gold, dust, and experience. I watched streamers like Trump and tried to get good at Arena. However, I was just not good enough at first as I barely scraped a 4-win average. Saved gold from quests and ranked play just weren’t enough to sustain me unless I played 10 hours a day. To keep me going, I bought Arena runs, viewing it as an investment for my future as a hearthstone player. I figured that if I got really good at Arena, I’d have all the cards I could ever want. Moreover, all the practice I would be getting would make me a much stronger Ranked player as well. In total, I bought 17 Arena runs before I finally managed to go “infinite” (about 3 months after I started playing). On the back of my Arena success, I haven’t spent a dime since and even bought Curse of Naxxramas with gold too. Despite going down this route myself, I know that it won’t be viable for a number of players. Being infinite in Arena is becoming increasingly difficult. If you’re just starting out, this hill can be even larger to climb due to learning curve. However, if you’re either patient or are willing to spend a little, you can grow a fairly large collection in this post-GvG Arena world. Let’s take a look at starting goals for your desired collection and then see how we can best get there. Hearthstone is not Pay2Win. It is pay to save yourself time (potentially a lot of it). There aren’t many people who are hellbent on getting a full collection. For what it’s worth, I don’t think it’s a realistic goal for most players other than full-time Arena streamers or those willing to splurge a large amount of money. In order to illustrate my point in this article and to have a benchmark for what is considered a “good” collection, I’m setting the goal for an average player to get 15,000 Gold. This is in addition to the gold you get from beginner quests, the first few free packs that come with GvG, and starting a new hearthstone account. I’ve come up with this value by adding the estimated value of Control Warrior – the most expensive meta-game deck – (11,500 dust) and the cost of Curse of Naxxramas (3,500 gold). Each pack yields on average 100 dust per pack. Therefore, the 11,500 dust needed to craft the Warrior deck from scratch should equate to around that same amount in gold. 15,000 gold is well enough to craft Control Warrior, or more likely, a number of cheaper competitive decks, while allowing you to have a sizable collection at your disposal. It definitely won’t be enough for those who want to be able to play whichever deck they desire but it does leave room for growth while allowing players to get the most out of the game. What I’m interested in is the daily amount of gold needed to reach this threshold (i.e. how long would it take an average player to be content / satisfied with their collection). I’m going to start with the Free2Play route and how to maximize gold gain. Nothing is more appealing than being able to play a premium game such as hearthstone for free. Luckily, Blizzard gives us plenty of ways to get gold if we’re really determined. The first thing you need to know about being a Free2Play player is how to get the most out of your daily quests. For those of you out of the loop, you have the option of re-roll a quest (to get a new one) once each day. The tiny red [x] on the top right corner of each quest allows you to throw a quest you don’t want back and get a new, potentially more profitable, one. I recommend re-rolling your 40 gold quests every single time regardless of what they are to try for a more lucrative one. On average, the value of each quest is worth 46.4 gold. You can improve this value by re-rolling every 40 gold quest you get to try for a 60 gold or the elusive 100 gold one. Doing this will ensure that you are working towards maximum gold gain. In completing these quests, you should be able to win a few games along the way. 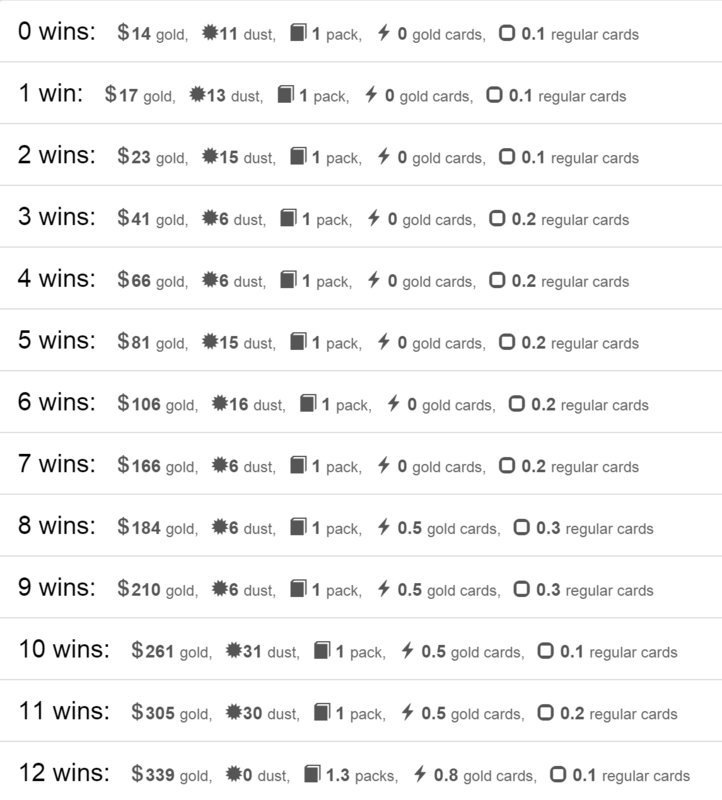 For simplicity’s sake, I’m going to say you win 6 games a night and get an additional 20 gold on average. In total, that means you’re gaining around 70 gold a day. It doesn’t look like much but over the course of a week, you can amass 490 gold just from grinding daily quests alone. By that math, it’ll take 214 days (or 7 months) to acquire 15,000 gold. That looks like a really long time on the surface but it’s really not quite that bad. I’ve been playing for almost a year and have a more-or-less full collection from going infinite in Arena. Doing just the dailies and winning 6 games a night can nearly get you there in 7 months. Luckily, if you have any interest in Arena at all, you can speed this process up a lot by getting good at it. Getting good and winning at arena is hands-down the best way to get gold, dust, and cards in Hearthstone. If you use your daily quests to save up for arena runs and average 4 wins or more, you can get gold and dust back at a higher rate than buying packs at 100 gold a piece. If you’re impatient and want to speed up your collection growth, I highly recommend you put in the time and effort to learn how to play Arena well. For those still learning, check out this guide by our own ADWCTA on Arena Fundamentals. The cost of entering arena is 150 gold. As can be seen from the above picture, getting 7 wins on average will easily make you an infinite Arena player. What isn’t capture by the image though, are the daily quests. If you complete your daily quests at an average of 46.4 gold per quest, you actually have enough to buy another Arena run after 6 wins! In addition to this, a 6-win average is exactly that – an average. Going 10+ wins even once every five runs or so really gives you a gold boost that can sustain you for a few extra days. My own average for Arena is closer to 6 than 7 but I’ve managed to amass 3,000+ gold just from having a few 12-win runs and from being diligent regarding my daily quests. Arena isn’t easy though so if you don’t want to put in the time to grind for a few months, there’s also the Pay2Win route. Don’t listen to anyone who says paying is for suckers. hearthstone is a great game, and its business model is very fair. It is designed such that we players are encouraged to spend a little in order to get the most out of the game. It is absolutely okay to want to spend a little bit to get the cards you want. I’m going to help you decide which option is best for you. As you can see, the best value you can get for your money is to buy Curse of Naxxramas in its entirety. 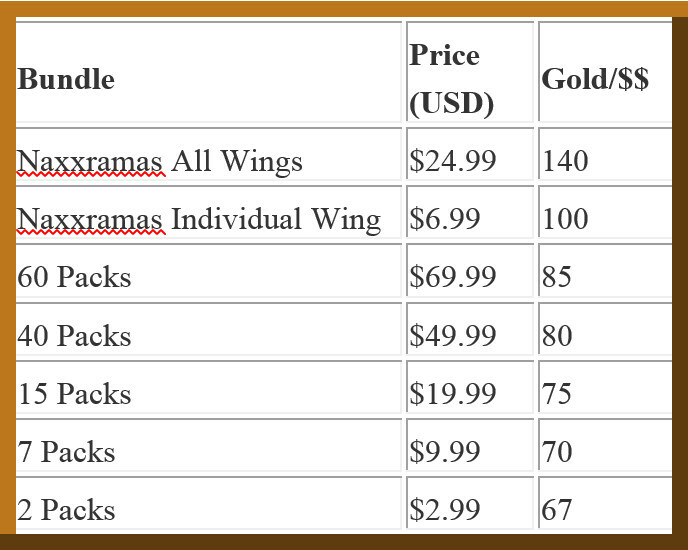 Blizzard decided to steeply price Curse of Naxxramas at 700 gold per wing. For the number of cards you actually unlock (roughly 6 unique cards per wing), it’s arguably overpriced. However due to the overall importance of the cards acquired via Naxxramas, the decision to invest in the whole set becomes straight-forward. are so prevalent in current meta-game decks that they cannot be overlooked. If you’re just starting out in hearthstone and haven’t unlocked Naxxramas yet, I highly, highly recommend you start saving gold or pay the $25.00 for it right away. It also has the additional perk of opening up a fun new solo adventure mode that offers some challenges and is quite a bit of fun in its own right. s (well you can’t get that one!). Buying Arena runs is also a valid route. They cost $1.99 but have the potential for big rewards. If you’re aspiring to become entirely Free2Play at some point in the future and trust in your abilities as an Arena player, I’d say spend a few dollars on Arena as an investment for the future. Unfortunately, this method is no longer as effective as it used to be for growing a collection from scratch because Blizzard has decided to only award Goblins vs. Gnomes packs as prizes. This means that a new player may be better off buying a 40 or 60 bundle of classic packs instead since most of the cards used in ranked decks originate from the classic set. s after opening just 50 packs. Thus, most of the cards I’ll be getting from this point onward are much less likely to be unique and will therefore be dusted right away. Buy Naxxramas first – It offers the best value and you’re guaranteed to get some very good cards. Buy Classic Packs if you want to increase your main collection fastest – They aren’t available in Arena currently and there are lots of cards to collect from the main set (many of which are incredibly good). Buy Arena tickets if you want to improve at Arena – In general, I don’t recommend buying Arena runs as a way to acquire more cards since it’s so heavily tied into how well you play. Only buy them if you want to focus on Arena play. But what if you’re kind of in the middle? Have a few cards, some decent decks, but want more cards? The next section is about balancing your expectations, gold gain, and hearthstone goals. I will be the first to admit that I’m not the best at balancing my expenses. Once you spend a little bit of money on Hearthstone, it’s very tempting to spend more. However, I’m here to tell you not to spend more than is needed for your goal as a hearthstone player. It can be a big temptation to buy a large number of pack if you’re missing a few key cards. But unless you get extremely lucky, it’s very easy to go home disappointed. I, myself, bought 10 additional packs of GvG cards (with gold), after initially getting 50, and got no new cards at all from it. There wasn’t anything in particular that I wanted but I just bought them anyway because I wanted ‘new cards’. While this can be fun and all, spending real money on cards, only to have them not be the ones you want, can be disheartening. 1. What do I want from my hearthstone experience? What I’ve found in hearthstone is that all players have very different ideas of what they want to get out of it. There are some who love the competition, some who are collectors, and some who just want to have fun. It’s important to know what you want out of your hearthstone experience before you commit to buying packs or bundles. Do you only play casually once every few days? If so, it’s probably best to just get gold from dailies and use it to buy packs. In a few weeks time, you’ll have a pretty large collection and can have fun ranking up while trying out new cards in the process. You won’t need to spend a dime while still being able to do what you want. If you’re a very competitive person and are totally hooked after your first foray into Hearthstone, spending on a bundle of card packs will drastically reduce the amount of time needed to get into the competitive side of the game. If you’re a long-term player like myself and can see yourself playing hearthstone for months/years to come, investing in your knowledge of the game through Arena can potentially enable you to play the game for free in future. If you’re a collector, you either have hundreds of playing hours ahead of you or a newly-emptied bank account. you’ve coveted for so long. for your Control Warrior deck. The combined dust value of those 3 cards is 4,800. Since each pack is worth on average 100 dust, your best bet is to buy a 40 pack bundle (as opposed to 60) and hope you get lucky opening them. If not, the dust gathered from those packs will get you much closer. You can either grind or pick up a smaller pack bundle to get the remaining dust amount needed. 3. Will I be able to make good use of the cards/dust? This is a legitimate question that many players don’t think about too closely. In the past, I’ve gone ahead and crafted some cards because I thought I’d need them right away and ended up not using them at all. Think about what exactly it is you need to complete your deck(s) before jumping in and buying packs. In all honesty, this probably applies more to dust ultimately, but you need gold to get dust so think about that beforehand. Finding a balance on hearthstone spending is tricky. You have to think about a number of factors that could all come into play. Most importantly, I recommend you think about what you want from your hearthstone experience. People don’t all want the same thing contrary to what the community on Reddit or other hearthstone forums say. You should not feel pressured or pushed into becoming a Pay2Win player if you don’t want to. Definitely don’t believe others when they say the game isn’t as fun if you don’t have an all-golden Control Warrior deck. , which you otherwise wouldn’t think to try if you had Sylvanas or Cairne in your collection. Pay for hearthstone because you love the game and want more of it, not because it’s a necessity to win. I am a three-time legend-ranked player with Level 60 heroes for every class. My favorite card in hearthstone is Lord Jaraxxus (gold of course!) and I’m also an arena infinite player with over 800 arenas completed. If you’re interested in Arena, here’s my Arena Mastery link and my own personal 12-Win Arena Log where I record every card/deck I’ve made it to 12 wins with (60+). I offer Ranked Ladder and Arena coaching through HearthstoneCoaching.com founded by Sheng. Visit the site if you’re interested in having me coach you!